I his vivid bird occurs in forest by streams and in wooded gorges of the Andes, feeding on fruit. The highly colored males perform noisy, communal courtship displays, at special sites known as "Icks," on bare branches in middle and upper vegetation. 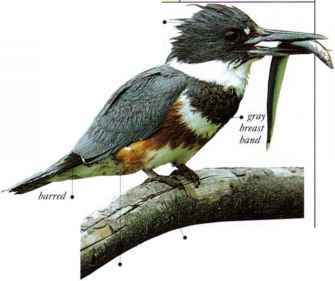 During display, males extend the crest forward, completely covering the bill. The shape of the eye also changes from round to narrowly elliptical. The females arc-cinnamon brown all over and have smaller crests than the males. They visit the lek and watch the displaying males, and eventually each female selects a mate. After mating, they perform all nesting duties and parental care, unaided by the males. • NliST A cup-shaped nest made of mud and stuck to a rock face in a sheltered hollow. • DISTRIBUTION Andes from Venezuela to Bolivia at altitudes where the climate is subtropical. A large cotinga with dark plumage, this species inhabits the middle and upper levels of the rain forest, where it feeds on insects as well as on fruit. Purple throated Fruitcrows live in small social groups. The members of each of these communities feed and rest together and care jointly for the young in the nest. In courtship, the male displays by puffing out his ruff of purple throat feathers. • NliST A shallow cup nest made of twigs, located high in a tree. • DISTRIBUTION Lowlands from Costa Rica through much of South America as far south as N. Bolivia and Amazonian Brazil. • REMARK Fruitcrows are the only cotingas that live in social groups. There arc three other species: the Red-ruffed, Crimson, and Bare-necked Fruitcrows, all living in South America.